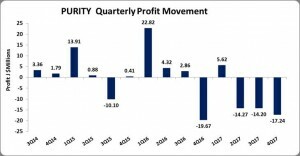 Consolidated Bakeries (Jamaica) Limited (PURITY) for the year ended December 31, 2017 recorded a 2.01% decline in revenue to $862.61 million from $880.27 million reported for the corresponding period in 2016. For the fourth quarter, the Company recorded revenue of $219.54 million (2016: $199.64 million), representing a 10% improvement year over year. Cost of sales for the period decreased 1.45% to close at $563.73 million (2016: $572.01 million), leading to a gross profit of $298.87 million (2016: $308.27 million). Within the quarter PURITY recorded cost of sales of $132.94 million, down 3.2% relative to $137.35 million booked at the end of the Fourth quarter for 2016. As such, fourth quarter gross profits totaled $86.09 million, up 39% year over year (2016: $62.29 million). Other income fell 90.53% to $874,770 relative to $9.24 million booked for the comparable period in 2016. Purity’s total expenses for the year amounted to $312.97million, an increase of 5.89% versus the $295.56 million reported in 2016. Of this, administrative expenses closed at $155.17 million, down 3.37% relative to the $160.59 million reported in 2016, while, selling expense was up 16.91% to close at $157.80 million (2016: $134.97 million). This resulted in an operating loss of $13.23 million for the reported for the year, compared to an operating profit of $21.95 million documented for the prior year. Finance costs increased 62.48% to close at $18.88 million relative to $11.62 million in 2016. The company reported deferred tax payments of $7.99 million for the period. Consequently, PURITY recorded net loss of $40.10 million in contrast to a net profit of $10.33 million the prior year. A net loss of $17.24 million was booked for the fourth quarter, compared to a loss of $19.67 million for the corresponding quarter in 2016. As a result, loss per share (LSP) for the year ended December 2017 amounted to $0.18 compared to an earnings per share (EPS) of $0.05 reported in 2016. The earnings per share for the quarter totaled $0.077 relative to an LPS of $0.088 in 2016. The number of shares used in our calculations is 222,709,171 units. Purity’s stock price closed the trading period on Thursday March 29, 2018 at a price of $2.00. Total Comprehensive income of $168.99 million was recorded for the period relative to comprehensive income of $13.92 million recorded the prior year. The Company, as at December 31, 2017, reported total assets of $992.14 million (2016: $731.40 million), an increase of 26% year over year. The increase was attributed mainly to a 39% growth in ‘Property Plant and Equipment’ which closed at $688.41 million (2016: $494.89 million). Total Stockholders’ Equity as at December 31, 2017 was $716.40 million (2016: $547.41 million), representing an increase of 31%. This resulted in a book value of $3.22 (2016: $2.46).